A recent scientific discovery has drastically changed our view of the global carbon cycle and identified a new significant risk. 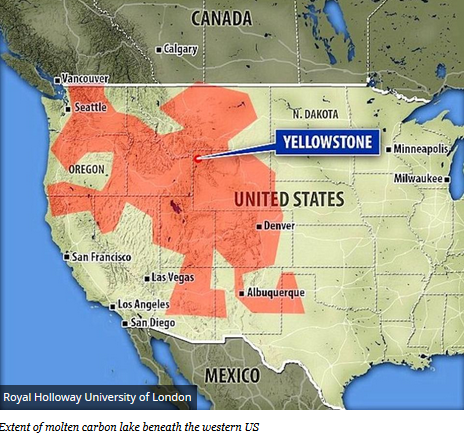 Researchers have discovered a giant lake or reservoir made up of molten carbon sitting below the western US. The molten carbon (primarily in the form of carbonate) reservoir could drastically and immediately change the global climate for over a decade if it were to be released. Thankfully there is little risk in the near future of this happening. The carbon sits 217 miles beneath the surface of the Earth in the upper mantle and has no immediate pathway to the surface. In total the lake covers approximately 700,000 square miles, approximately the size of Mexico. This has redefined how much carbon scientists believe sits locked away in the Earth's mantle and its interaction with surface and atmospheric carbon. Geologists at Royal Holloway University of London were able to use the largest array of seismic sensors in the world to detect what exists below the surface of the western US. In total 538 sensors were used to create a three-dimensional view of the regions subsurface. They do this by measuring the time it takes for sound waves to travel into the Earth and bounce back. Depending on the structure of rock in the subsurface, different waves will bounce back at different times and at different angles. Complex algorithms integrate the data to reveal a picture of what exists below the surface of the Earth. Scientists are limited to viewing the molten lake through seismic imagery as it is far too deep to reach via a drill bit. You may be asking why and how this lake of molten carbonate exists in the first place. It is a result of the Pacific Plate subducting underneath the North American Plate. As the Pacific Plate subducts, it experiences increasingly high pressures and temperatures. This, combined with the presence of gasses such as CO2 and water locked away in the rock, allows for partial melting of the plate. This is a similar process by which the Rockies Mountains formed in the western US. For a more in depth review, this is a great explanation. Schematic of a subduction zone whereby the subducting plate melts, causing volcanism at the surface. The molten carbonate sits beneath Yellowstone National Park, which in and of itself is a super volcano with the power of a massive eruption. The last major eruption was 640,000 years ago at Yellowstone, however if the super volcano did erupt it could cause the US to go into a volcanic winter. The eruption, when it does occur, would be on the order of 1,000 times more powerful than the 1980's Mount St. Helens eruption. In part due to this research, scientists now believe the Earth's upper mantle may hold up to 100 trillion metric tons of carbon. To put this into perspective, the US EPA estimated that in total 10 billion metric tons of carbon was emitted in 2011, or approximately 0.01% of the carbon sitting in Earth's mantle. Thankfully the release of the mantle's carbon happens very slowly over time primarily through volcanic eruptions. However, paleoclimatic fluctuations in CO2, creating ice ages and greenhouse global conditions are partially linked to dynamic changes in volcanism.